Chartwell Telecom offers range of solutions for Banks, Brokerages, Hedge Funds, Asset Managers and other financial institutions are working withfinancial and other markets. The strong technical support and short installation time are our benefits for increasing customers. VTB Bank (implementation LAN/WAN network between India and Russia). and additionally, based on implementation of software for financial institutions and banks. The core idea is to implement end-to-end financial IT solutions and services to cover the full trade lifecycle from front office price discovery to back office STP confirmation and beyond. Current developments include the Hybrid Execution Platform to manage trading workflow across electronic and voice execution, designed from the outset to comply with Dodd-Frank and MiFID regulatory developments. Chartwell, in conjunction with ASPone company, can provide the mentioned solutions. Together with ASPone we can provide a comprehensive range of solutions based on a flexible and powerful suite of software components that can be used individually and in conjunction with incumbent systems. Multiple components can be used together to solve a specific requirement. Solutions modules cover the full trade lifecycle, supporting compliant and efficient activity from pre-trade price discovery and analytics, through order management, to back office STP confirmation and beyond. 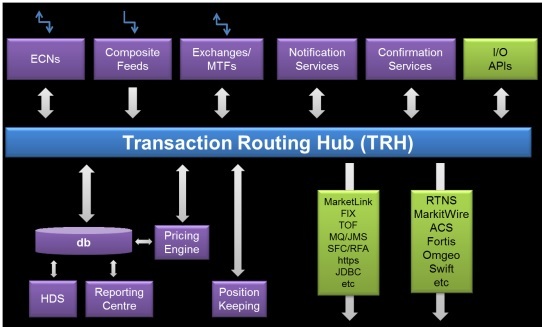 The Transaction Routing Hub (TRH) is a data aggregation, routing, storage, processing, reporting and forwarding system for pre-trade, trade and post-trade data. TRH is used as the core messaging layer in a number of products covering FX Trading, Deal Entry, Post Trade Aggregation, confirmation service connectivity etc. 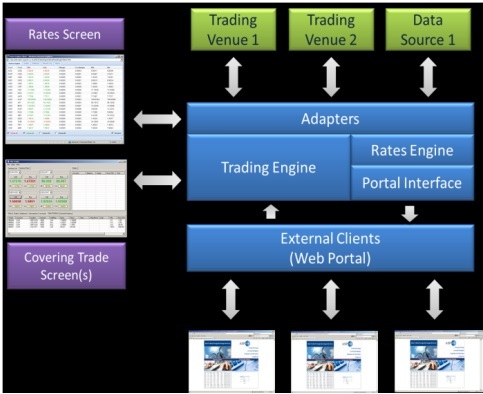 Pre-trade market data can be sourced from ECNs, Direct Exchange Feeds, Composite Feeds and internal systems. Source feeds can be streaming, snapshot, RFQ or RFSQ services. Trading connectivity and associated post-trade messaging (fills, partial fills, cancels, execution reports etc.) from ECNs, exchanges and internal systems are supported in order to provide a complete aggregated trading interface. The core routing engine is capable of supporting a number of routing paradigms including inter-desk, liquidity, best execution and custom. The pricing engine provides administrators with the ability to manipulate prices on a per instrument, customer and quantity basis. Data processing components including a database for storing all received data. Market and trading data can be routed to any of the available system outputs. Available interfaces support industry standard APIs for connection to internal and third-party systems. A number of adapters supporting third-party notification/confirmation services for the external distribution of post trade STP messages is supported, including RTNS, MarkitWire, ACS, Omgeo, Swift etc. The Transaction Routing Hub – Real-Time (TRH-RT) is an IP-based messaging network. Its product suite provides professional, cost effective solutions for real-time financial market data integration, distribution, storage, management and presentation requirements. TRH-RT provides scalable, resilient and secure access to financial market data from external market data providers and from internal data-generating applications. Distribution over LAN, WAN, wireless networks and the Internet is supported. The available data can be presented in native client applications, spreadsheets, web-browsers and bespoke applications or on wireless devices using the available APIs. TRH-RT supports all financial asset classes and all types of data – real-time streaming prices, intraday time and sales data sets, historical prices, reference and overnight prices and news. TRH-RT software components can be used in isolation or in conjunction with existing in-house applications or third-party Market Data Systems. 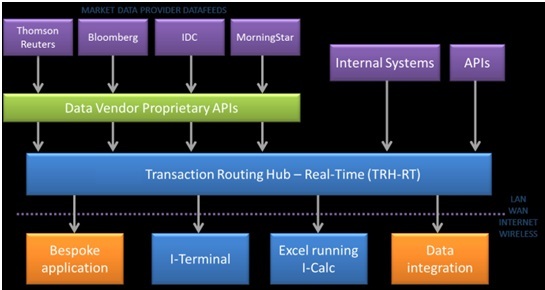 TRH-RT integration components (feed handlers) support the reception, manipulation and forwarding of a wide range of financial news and data sources irrespective of their physical transport mediums, software protocol or architectural implementation. TRH-RT is optimised to minimise the time between data being received from a market data source and the same data being passed on to onward applications thus making it suitable for low latency solutions and applications. TRH-RT has been designed to support high data throughput routing across hundreds of input and output connections using IP connectivity. Individual system components are connected together and communicate and share data over a high speed messaging bus. Received market data and news items is available for immediate retrieval by TRH-RT presentation components as well as being stored to a high speed data cache and are. For historical data, the storage solutions support efficient writing and retrieval of data items in conjunction with a number of commercial databases, at user configurable time intervals. The TRH-RT product suite provides an extensive browser-based administrative user interface for comprehensive system, component, data and user management. Users accessing the system have to provide individual credentials and be authenticated, all subsequent requests for services and data being governed by a strict entitlement system. The presentation of information available within TRH-RT, to client applications and internal and third-party systems, is through use of open APIs, which are available as TCP/IP, C++ and Java. Desktop applications, including I-Terminal, the market data terminal, and I-Calc, MS Excel Add-In, leverage the full power of the native operating system or host application to provide powerful performance and a familiar user interface. I-Terminal provides the ability to display individual quotes, quote lists, chains, pages and charts. 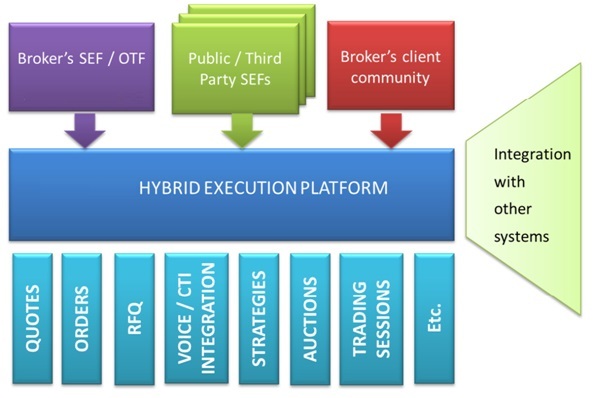 The Hybrid Execution Platform (HEP) provides connectivity and workflow between financial counterparties by integrating voice and electronic trading. Its flexible hybrid design brings compliance in accordance with increasing regulation as well as accuracy and efficiency to the trading workflow. HEP brings a converged desktop experience to dealers and brokers, synchronising how quote trading, order matching and RFQ management are conducted via voice and electronic means from price discovery through to trade execution and beyond. 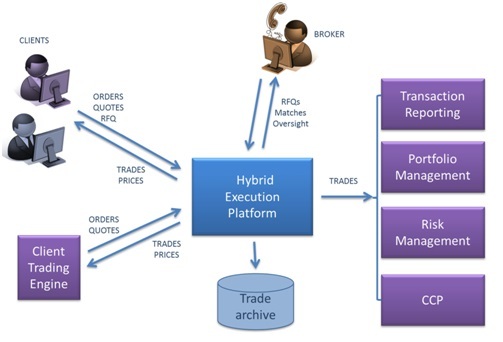 HEP supports quote and order workflow, manual and semi-automated trading and broker-facilitated execution. Other configurable features include price re-confirmation following a trade, full order control and strategy management. We actively monitor relevant regulatory initiatives and endeavour to meet evolving requirements in order to ensure that clients meet their applicable compliance obligations. The functionality and methodology of the platform are designed to meet varying regulations being finalised across the global financial markets including the Dodd-Frank Act in the US and MiFID II / EMIR in the EU. The platform comprises a series of building blocks which ensure that dealer and broker activities are correctly segregated. The architecture also enables interfacing with third party liquidity pools where permitted. Orders and quotes are configurable for individual asset classes and trading styles. Order types can be market, fill or kill, limit or timed. Quotes can be indicative or firm. Both orders and quotes can be anonymous (optionally with name give-up) or attributed. RFQ workflow is supported. The platform can be configured to define trading / non-trading times and dates, run individual trading sessions and schedule auctions and start-of-day and end-of-day processes. HEP can support a variety of holiday calendars. HEP supports voice and electronic trading convergence through workflow integration with a suitable trader voice system and compliant reconciliation of voice trade recordings for dispute settlement and workflow optimisation. HEP integrates with other systems forming part of a complete trading workflow, including CTI, post-trade reporting systems, central counterparty clearers (CCPs) and trade data repositories. HEP is asset class agnostic and capable of trading all OTC financial markets including swap / derivative instruments that are the current focus of regulators. The platform is in use trading FX ATM options, risk reversals, swaps, straddles, strangles and butterflies. Other instrument types can be added easily. HEP blotters show clients their own orders and trades, and brokers see all trades. Trades are archived for regulatory purposes and disseminated to other applications and systems. The platform has been designed to minimise the technology footprint at client locations. User access can be via private network or across the Internet. The HEP core system can be deployed at the trading / broking firm site or hosted by us or partner’s company. The central components have been designed to safely fail-over and ensure a continuous trading service with no single points of failure in the provision of a trading platform. The HEP architecture is highly scalable and designed to support large transaction volumes and user connectivity. The user interfaces can be white-labeled and tailored to create a differentiated offering. HEP can optionally support auctions, chat facilities, whiteboards and indicative pricing distribution. Each of these modules is configurable and provides a selection of features. HEP can be implemented to operate across multiple global locations, supporting split-desk operations and continuous trading. We provide a full range of support levels to meet client requirements throughout the trading day. Where a client wants to incorporate exchange trading into the same platform, HEP will integrate direct exchange interfaces and support the required workflow. The Deal Entry Suite provides a range of functionality for the capture, processing and notification of voice brokered trades. Its broad choice of interfaces allows it to be integrated with internal systems and third party notification services. DES is suitable for use in conjunction with an institution’s existing systems either as a standalone notification / confirmation service or as a complete deal management system in its own right. deal processing - cash collection, reports, invoicing, brokerage. DES supports a wide range of financial instrument types including foreign exchange, money markets, equities, derivatives, fixed Income. industry-standard APIs including FIX, FpML. DES provides users with the ability to enter trades for immediate or delayed notification over several established notification service providers and supports the following high level functionality through easy to use flexible frontends. front office users can create, modify and save trades through tailored deal entry screens for each instrument type. Trades are then notified to TRTN-enabled banks through full TRTN affirmation workflow and displayed in pending, confirmed and cancelled tabs. back office users can view trades entered by the front office, amend, enrich and re-notify them as well as mark them as “processed” if they are being manually entered into an existing back office support system. Trades can also be archived. FXTS provides an end-to-end trading solution for physical foreign exchange providers. FXTS can meet a broad range of requirements from Private Client (Retail) to Corporate FX transaction services. FXTS supports the complete end-to-end transaction lifecycle covering pre-trade, trade and post-trade workflows. The system is created from individual components, allowing a wide range of implementation options to be supported, from pre-trade price aggregation to a complete standalone end-to-end trading service. FX rate information is sourced from one or more FX trading venues and / or data sources and aggregated into a normalised internal format. FXTS supports streaming interbank prices from composite feeds and snapshot / streaming prices for individual currency pair quantities from FX bank portals. Individual rates are manipulated using one or more of own Rates Engine, third-party calculation engines including Complex Event Processors (CEP), custom applications leveraging the FXTS Pub/Sub API or MS Excel. The resulting pricing information can be fed into a client’s existing system for presentation to their customers on a voice or electronic basis or distributed using own FX Portal, as either a standalone web site, an additional web page or an embedded quote and trade windows. Clients place orders for foreign exchange currencies by telephone or via the web portal. These are displayed in FXTS as individual entries in the Order Blotter. The balance of each currency sold is calculated in real-time and presented as a line on the Balances screen. Covering trades, for each required currency, can be executed over the phone with the FX institution’s trading partners or over direct connections to trading venues. On completion of a trade, the appropriate balance is adjusted. Internal systems can be interfaced through the FXTS trading API or by using the covering trades screen. This screen displays buy and sell prices from all connected venues and allows users to trade through a simple interface. Trades can be executed on a manual basis or using Smart Order Routing (SOR) which executes trades on a specific venue based on any number of criteria including currency pair, rate, quantity, date, best price, volume traded etc. Trades executed through venues using FXTS generate execution reports. Depending on the venue, these messages can be received from a third-party notification service such as Thomson Reuters TRTN or directly from the venue. Received execution messages are stored in FXTS for later retrieval and forwarded to downstream applications. We provide a flexible output adapter architecture for downstream systems, capable of producing a number of protocols, including XML, FpML, FIX, TOF, CSV, JDBC etc. FXTS can be integrated with payment systems for the disbursement of funds to individual or multiple beneficiary accounts. All trades executed on venues can be viewed in a trade blotter and enriched by adding settlement instructions and allocated to multiple customer accounts as necessary. For longer term trade analysis and reporting, the Reporting Centre can be used; it provides a flexible interface for the generation of reports in multiple output formats including HTML, PDF, XML and MS Excel. Summarized all below, we offer combined solutions based on high quality network access with low-latency, hosting, monitoring and software implementation. Contact us if you need more information about connections or TRH-RT, HEP, Deal Capture, Deal Management, FX Payments Management etc.